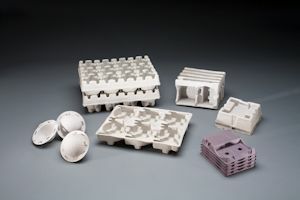 August 4, 2014 – Georgetown, Massachusetts – UFP Technologies, a producer of innovative custom-engineered components, products, and specialty packaging, will be exhibiting its molded fiber packaging solutions at Pack Expo International from November 2-5, 2014 in Chicago, Ill. Pack Expo is a global leader in showcasing the latest innovations in the world of packaging and processing. Pack Expo International 2014 will bring together more than 50,000 attendees and 1,800 suppliers from across the globe. UFP Technologies will be located at booth #8228. At this year’s Pack Expo, UFP Technologies will be showcasing a variety of custom molded fiber, also known as molded pulp, packaging solutions. Molded fiber is a sustainable, eco-friendly and cost effective packaging material made from 100% recycled newspaper and water. UFP Technologies has designed and manufactured molded fiber packaging for more than twenty years. Our advanced manufacturing capabilities and patented design process allows us transform molded fiber into countless applications including packaging for retail, electronics, health & beauty products, medical instruments and other consumer goods. In recent years UFP Technologies has advanced molded fiber as a viable packaging choice for more fragile items including desktop computers, electronic razors, and smart phones. UPDATE: UFP Technologies will be exhibiting at Pack Expo Las Vegas 2015 from September 28-30 at booth 9209. For free admission to Pack Expo Las Vegas 2015 please click here and fill out the form on the page.